NASA astronaut Sunita Williams (left) helps Japanese astronaut Akihiko Hoshide (right) prepare the space station's robotic arm during their spacewalk on Sept. 5, 2012. It took hard work, determination and some MacGyver-esque ingenuity for a pair of spacewalking astronauts to fix a key power system aboard the International Space Station Wednesday (Sept. 5). NASA spaceflyer Sunita Williams and Japanese astronaut Akihiko Hoshide spent nearly 6 1/2 hours yesterday outside in the vacuum of space to properly install a pair of bolts that had caused problems for the pair during a previous spacewalk last week. 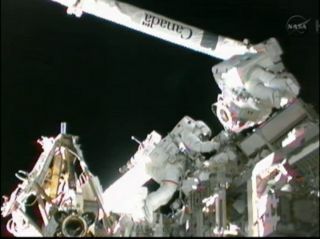 In addition to their regular spacewalking gear, Williams and Hoshide were armed with some makeshift tools — including an improvised wire cleaner and a toothbrush — to help them get the job done. On Aug. 30, Williams and Hoshide completed a marathon spacewalk that lasted more than 8 hours, but the astronauts were thwarted by a stubborn bolt and were unable to finish connecting the so-called main bus switching unit (MBSU). The stuck bolt forced NASA to add Wednesday's extra spacewalk. But, following last week's unsuccessful attempt, flight controllers, engineers and veteran spacewalkers worked around the clock at NASA's Johnson Space Center in Houston to devise a solution to the problem. Using only the supplies available on the space station, the teams came up with creative new tools for Williams and Hoshide to use to install the MBSU. "We knew that we had particles down inside the socket, so they came outside with yet another tool that was developed by the ground team," Johnson told reporters in a post-spacewalk news briefing. The inventive ideas that led to today's spacewalk success demonstrates how well the teams on the ground and in orbit work together, and shows the dedication of those involved in the agency's space station program, said flight director Ed Van Cise. "It was really amazing to watch the ingenuity, to watch the flight controllers," Van Cise said. "It was amazing to see it all come together." And with the MBSU now up and running, mission controllers are now able to breathe a collective sigh of relief. "Looks like you guys just fixed the station," astronaut Jack Fischer radioed to Williams and Hoshide after the MBSU had been installed and powered up. "It's been like living on the set of Apollo 13 the past few days. NASA does the impossible pretty darn well, so congratulations to the whole team." And while lives were not in danger on the space station as they were during the aborted Apollo 13 mission to the moon, the atmosphere and tension in Mission Control resembled the experience during NASA's daring rescue in 1970, particularly as it was portrayed in the 1995 film "Apollo 13," directed by Ron Howard. "Similarities really were there to watch how the team came together," Van Cise said. "Just the theme that comes to mind — we did make jokes and talk about Apollo 13. 'Failure is not an option' is certainly something I mentioned a couple times, because we had to get this installed." Still, it was the cooperation of the team members, and the creativity of their solutions that made flight controllers draw parallels between today's spacewalk and the Apollo 13 film. "The free flow of ideas from any corner that might have helped us was just like the movie and in real life," Van Cise said.